The launch follows on the heels of the launch introduction of load balancers in February, this is one more step in delivering on DigitalOcean Chief Technology Officer Julia Austin‘s promise to expand DigitalOcean’s capabilities for making the cloud easier to use. Developers can monitor inbound and outbound bandwidth, collect metrics and set specific thresholds by percent (e.g., if your CPU usage is above a seventy percentage, an alert is generated). 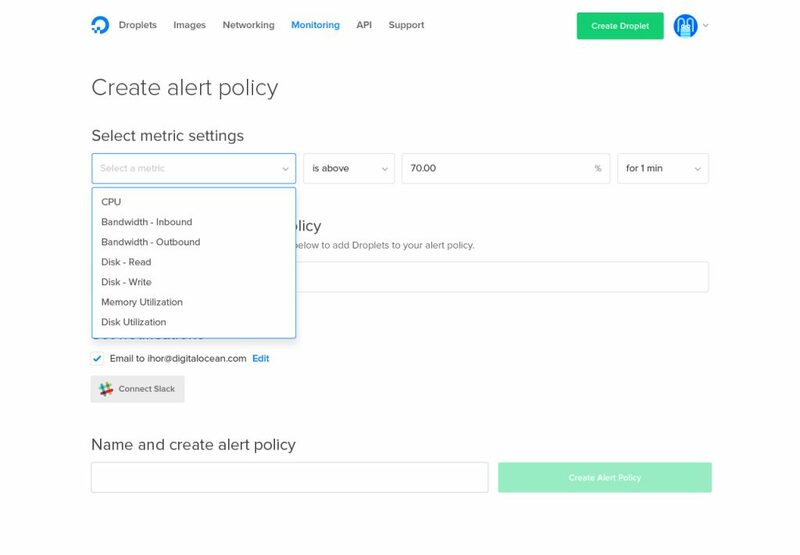 Alerts can be delivered via email or Slack, depending on developer preference. If all this sounds familiar, it is. There is nothing new about the functionality, conceded Wainer. It’s about allowing their customers to move away from external monitoring service likes DataDog or NewRelic. What’s different is that the service is integrated into each Droplet in an easy-to-view interface, with no configuration required. Adding monitoring while spinning up a new DigitalOcean cloud server is a breeze with no configuration required beyond going through a few checkboxes. Monitoring can be done through their control panel or through an API. Which is simple to use and set up, according to Wainer. Already have Droplets and want to add monitoring? Or didn’t configure it when you set up your Droplet? No problem: An open source graphing agent will enable Monitoring on an existing Droplet. NOTE: The full instructions are here. “It’s all about simplifying the toolset to manage, monitor, configure their environment,” said Wainer. DigitalOcean is redefining the cloud space, he said, making it easier and simpler to set up. The company is all about developer loyalty. DigitalOcean was created with developers, not enterprise, in mind, he said. In the past, growth has mostly been from the bottom up, Wainer explained. Developers use Droplets at home, then take DigitalOcean to work when the company starts needed cloud solutions. DigitalOcean now has over 50,000 teams using their product daily. The easy setup saves time, enabling businesses to move a lot faster, he said. The company continues its aggressive roadmap, thanks to Austin. “She’s helping us level up,” Wainer said. There are a lot of products in the pipeline, he said, and many are focused on being able to scale with ease and use distributed services on top of DigitalOcean. By the end of the year, the product will be much more robust with the ability to support larger production workloads. Next up: expanded security features.